The 2018 Portland Book Festival presented by Bank of America will feature 100+ authors presenting on 9 stages, pop-up readings throughout the Portland Art Museum galleries, and 11 writing workshops. The festival includes activities for readers of all ages, an extensive book fair with 90+ vendors, local food trucks, and partner events all weekend long. Founded in 2005 by local writer Larry Colton and renamed in 2018, the annual festival always featured an impressive lineup of local and national authors and a book fair. But its original incarnation, held at the expansive Oregon Convention Center through–2013, wasn’t quite the “metaphorical public square” that Literary Arts Executive Director Andrew Proctor, the festival’s new leader, had in mind. Enter the Portland Art Museum. As the festival’s rebooted primary venue, the museum provides a backdrop for art, history and culture to merge with conversation, books and ideas. With Literary Arts at the helm, the festival is now condensed into a robust one-day event (with partner events, including a “Lit Crawl,” taking place throughout the weekend). The fest is packed with on-stage author conversations, interviews, panels, interactive Q + A’s, pop-up readings in galleries, teaching workshops, kids’ story times, live music, an expanded book fair and — in true Portland fashion — food trucks parked outside. 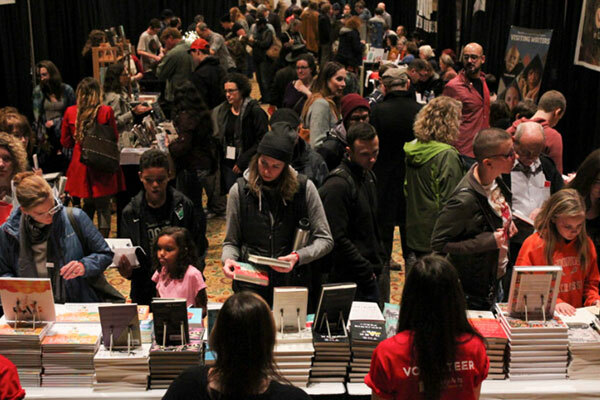 In short, Portland Book Festival’s new iteration celebrates contemporary literature in a way that feels, well, contemporary.